Location: The Map Collection is located in the SE corner on the 4th floor of the PSU Library. Topographic maps show the shape and elevation of the terrain. Most of the topographic maps in the Map Collection are 7.5 minute, 1:24,000 scale. These maps are produced by the U.S. Geological Survey (USGS) The Library also has a collection of 15-minute maps (1:62,500). This series was abandoned effective 1 June 1996; the USGS 7.5-minute (1:24,000) series is the official replacement for the 15-minute series, except for Alaska which is not yet mapped to 1:24,000. Fifteen-minute quadrangles, along with historic editions of all maps, are kept only for the states of Oregon, Washington, Idaho and Nevada. Topographic maps are identified by state and then by the quadrangle name. The index maps for each state are located in the first drawer of maps for each respective state. The Library also keeps index maps for the topographic series at Ready Reference (2nd floor). After a quadrangle has been located on the index map, the quadrangle can then be located in the appropriate drawer. The quadrangle maps are arranged in alphabetical order in the drawers. Topographic maps also can be viewed and downloaded for free from the USGS Store. B.L.M. maps are topographic maps used primarily as cadastral maps (or maps that show land property-ownership lines). These maps show some surface features, but are used primarily to identify land ownership boundaries and property descriptions. These maps are also identified or referred to as surface management status maps. The B.L.M. also produces mineral management status maps. Mineral management status maps identify the federal agency that owns the minerals in a given quadrangle. Sometimes the surface management status data and the mineral management status data are included on the same map. The B.L.M. maps are arranged by state and alphabetical quadrangle name. BLM maps for Oregon are filed in Map Case 9, drawers 10-11. The 1:50,000 series of domestic topographic maps is prepared and distributed for the DMA by the USGS. They are filed alphabetically by state and then map name in Map Case 13, drawer 3. The library also has a set of World/Regional maps that consists of hundreds of maps of various kinds (e.g. general, planimetric, topographic, road maps) at various scales. Although essentially inactive (dating back to the time of the Army Map Service) this set often contains the only maps in the collection covering certain areas of the world. DMA maps are arranged in lettered and numbered series in Map Cases 10 and 11. Individual sheets are filed alphabetically within each series. Indexes to this collection include the DMA Map Depository Catalog located in the map room and the Defense Mapping Agency: Public Sale Topographic Maps and Publications located in Ready Reference on the second floor. USGS topographic quadrangles [Forest lands] (scale 1:24,000) in Map case 15, drawers 6-10; Oregon quadrangles in drawer 8. US Forest Service maps (various scales) in Map case 15, drawers 6 10- These are maps of national forests and wilderness areas in the states of Montana, Wyoming, Idaho, Washington, northern California, and the Tongass National Forest of southeastern Alaska. Also includes Forest Visitor and Travel maps. Oregon wetland maps are produced as part of the National Wetland Inventory (NWI) of the U.S. Fish and Wildlife Service. Wetlands are identified from aerial photographs, based on vegetation, visible hydrology and geography in accordance with the Classification of Wetlands and Deep Water Habitats of the United States (FWS/OBI-74/31 Dec. 1979). This information is superimposed on USGS topographic quadrangles, of which there are about 1,884 for the state of Oregon. Holdings in our collection are indicated on the Oregon Wetland Inventory [Index to 7.5 min. maps] in Map Case 18, drawer 4. In general, our holdings consist of wetland maps for the Metro area (Multnomah, Washington, Clackamas counties) and the Columbia river from Astoria to the Dalles. Forest maps for states other than those listed above and miscellaneous fold out maps, atlases, and brochures are in the Government Documents area under the call number A 13.28:. Nautical charts are special maps used for navigation at sea. These charts are produced by the U.S. National Ocean Service, a component of NOAA. The charts are un-cataloged and are arranged by stock number. The National Imagery and Mapping Agency (NIMA) Nautical Charts are catalogs that indicate which region is attached to which stock number. The NIMA catalogs are on the Index Table adjacent to the Nautical Maps & Charts. Additionally, the map drawers in Map Cases 15-16 are labeled by region. Geologic maps provide information on the structure of the Earth, such as types of rocks exposed on the Earth's surface and types of bedrock that underlie the surface materials. Several different geologic map series are produced by the USGS. Examples include: Coal Investigations (C), Circum-Pacific (CP), Geological Quadrangle Map Series (GQ), Geophysical Investigations (GP), Hydrologic Investigations Atlases (HA), Land Use and Land Cover Maps (L), Mineral Investigations Resources (MR), Miscellaneous Field Studies (MF), Geologic Investigations (I), and Oil and Gas Investig. Charts & Maps (OC / OM). These maps are identified by a series name such as GQ or GP, and then a number. The Guide to USGS Publications (Andriot, 1997, & located on the top of map cases F1-F9 in the Map Collection) and the Guide to USGS Publications (Andriot, 1998, & located in Ready Reference on the 2nd floor) are particularly useful for identifying geologic maps by area or subject. Additionally, it's possible to search for recent geologic maps and publications via the USGS Library at http://library.usgs.gov or the library's online catalog. Thematic maps provide information on special topics or themes. Examples of topics or themes covered are politics, economics, hydrology, population statistics and demographics. Thematic maps are often statistical in nature. These maps have call numbers and are in the Library's catalog (Vikat). CIA maps are primarily political maps produced by the CIA. These maps occasionally include thematic insets providing information on economic and social topics as well as features of the physical environment. CIA maps are located in 4 binders in Ready Reference on the 2nd floor and in a drawer in the Map Collection on the 4th floor labeled SUDOCS PREX CIA (Case 19), located in the center of the map room. Travel maps (road maps, city maps, auto-touring maps) are filed in folders in the drawers next to the map table. There are two sets: International (alphabetical by country, city) and Domestic (alphabetical by state, city). There is no index for travel maps. Additional travel maps for Oregon and the Portland Metropolitan area are filed in pamphlet boxes in the Ready Reference section on the 2nd floor. Aeronautical maps are produced and distributed by the Aeronautical Charts Service of the Department of Transportation and are received in the Library on a regular basis via the depository program. These maps serve the needs of aircraft at low and intermediate altitudes. Maps in this series include the Sectional Aeronautical charts and the VFR Terminal area charts (these maps provide greater detail for several terminal areas). These are cataloged and searchable in Vikat. Aeronautical maps are located in the blue plastic boxes on shelves next to the Map Collection. Flood Insurance Rate Maps are published by the Federal Emergency Management Agency, under its National Flood Insurance Program. These black and white folded maps show flood plain boundaries, flood zones (defined by 100-year and 500-year flood boundaries), base flood elevations, special flood hazard areas, corporate limits, cultural features, and more. Each incorporated area (e.g. Portland, Beaverton) within a county has its own index map, and there is a separate index for the unincorporated areas of each county. Portland State's collection includes maps for all Oregon counties. METRO is the directly-elected regional government serving Clackamas, Multnomah and Washington counties and the 24 cities that make up the Portland metropolitan area. 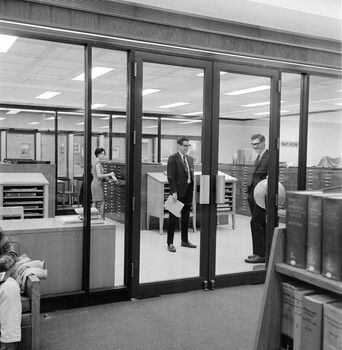 Portland State owns several products of its Data Resource Center including various thematic maps in drawer 2 and aerial photographs in drawers 3-11. Each photomap covers four sections from the township/range section grid. There is an Index to Aerial Photographs on top of the cabinet. Portland State owns sets produced in 1990 and 1997, the latter of which is in color. Thematic maps of the City of Portland are found in the first and last drawers. Looking for Maps? Ask Us! Aeronautical Charts and Related Products (located in the 4th floor Map Room and in Ready Reference - C 55.418/2:) provides access to the charts located in map cases 9-11. The Aeronautical Chart User's Guide (Ready Reference - C 55.408:AE 8) provides an explanation of terms and symbols used on the various charts. Defense Mapping Agency (DMA) Map Depository Catalog (located in the 4th floor Map Room) is the most complete record of holdings for the DMA map collection. Of particular interest is series 1301, a large collection of maps covering most areas of the world. Defense Mapping Agency: Public Sale Topographic Maps and Publications (located in Ready Reference) applies only to DMA maps currently available, a very small portion of the total DMA collection. Guide to USGS Publications (Andriot, 1997, & located on the top of map cases F1-F9 in the Map Collection) is particularly useful for identifying geologic maps by area or subject. Monthly Catalog of U.S. Government Publications (print copy located in Reference - Z1223 .A18, ONLINE FROM 1994-PRESENT) to find maps issued to depository libraries from the Government Printing Office including those from BLM, Census, CIA, etc. National Imagery and Mapping Agency Catalog of Maps, Charts, and Related Products, pt.2 vol. 1 (print copy located in located in the 4th floor Map Room) provides information similar to the NIMA Nautical Charts and Publications: Public Sale catalog. Catalog of [Nautical] Charts and Publications (print copy located in located in the 4th floor Map Room - C 55.418: and in ready reference) is a series of fold out index maps issued in five parts. Nautical Chart Symbols, Abbreviations, and Terms. Chart No. 1 United States of America contains descriptions of current preferred U.S. symbols shown on NIMA charts.